Students in the online Accounting Cycle class offered over winter intersession attended a presentation by Raul J. Anaya CPA, CFE, CGFM, Senior Audit Manager, and Jeremy Stuart, CPA, MBA, Tax Manager, both of CliftonLarsenAllen, LLP. Mr. Anaya and Mr. Stuart offered anecdotes, insights, and practical advice on careers in public accounting. The presentation was in a question and answer format addressing issues such as "What is a typical day for a staff accountant?" and "How much travel is involved in public accounting?" Professor Robert Tepper of Anderson Accounting Department discussed the topic of taking and passing the CPA exam. 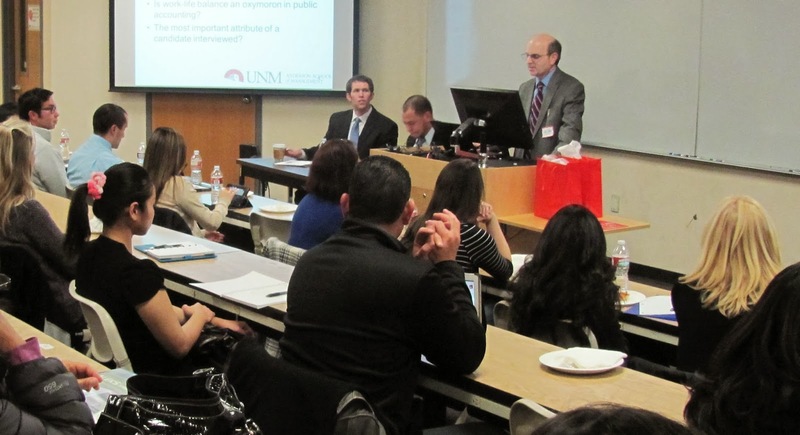 Students had questions in areas such as the differences in requirements across states in obtaining a CPA license, and the experience requirements in New Mexico. 2014 Hall of Fame - Lift Off!